Vinoba Bhave sits with folded legs by a body of water, 1952. Vinoba Bhave writing during the Bhoodan Conference at Bodhgaya, Bihar/India, 1954. Vinoba Bhave during the Bhoodan Conference at Bodhgaya, Bihar/India, 1954. Vinoba Bhave spinning, c. 1954. Left: Nandini Bajaj (Mehta). Vinoba Bhave spinning during the Bhoodan Conference at Bodhgaya, Bihar/India, 1954. 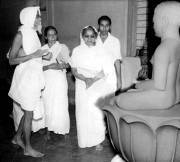 Vinoba Bhave visiting the Ladies Jain Ashram Temple at Sholapur, c. 1954. Vinoba Bhave and Gujarati Sarvodaya worker Ravishankar Maharaj, c. 1954. Vinoba Bhave and Prime Minister Jawaharlal Nehru at Bodhgaya, Bihar, 1954. Vinoba Bhave delivering a speech, c. 1954. 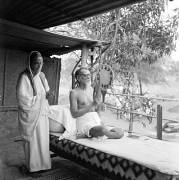 Vinoba Bhave with an associate, Paunar Ashram near Wardha, Maharashtra, 1956.